Bathrooms are a source of moisture in a home. Good bathroom ventilation is suggested to avoid moisture and excess build-up from biological pollutants such as mold and mildew. Excess pollutants are not only detrimental to your health, but can also lead to the deterioration of structure supports and walls. As the trend to larger spa-like bathrooms continues to gain in popularity, the need for proper ventilation becomes more important. 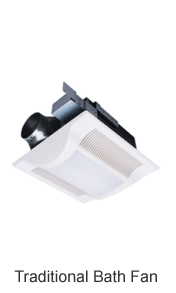 IAQSOURCE offers traditional, ceiling mount bath fans as well as inline bath fans and kits. The advantages of inline fan placement are ease of installation and decreased fan noise in the living space. Inline kits contain both a fan, and an exhaust grille / damper combination. The only other components needed for installation are electrical switches for fans / lights, exterior vents, and ductwork. 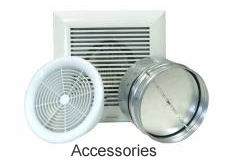 IAQSOURCE.COM sells all of these components to create a complete ventilation solution. We also offer fans for kitchen ventilation over stoves and ranges. Many homeowners struggle with rooms or areas in the home that are too hot in the summer, or too cool in the winter. Airflow through an undersized or poorly planned HVAC system can be increased by the use of booster fans. Inline fans solve air delivery problems without major system rework or expense. 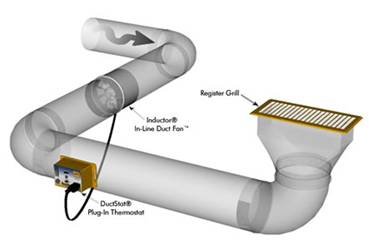 Fans can be controlled by a duct thermostat (shown) or wired to the central blower with a relay. If inline fan installation is not feasible � a register booster fan can be used for the same purpose. Under prime conditions, residential and commercial clothes dryers should dry clothing in a timely fashion. Problems occur when dryers are connected to long runs of duct work. This is the reason why most residential dryers are located against outside walls. The exhausted air is vented directly to the outside without complicated ducting to hinder the performance of the dryer. Many dryer installations do not allow direct venting and the typical residential dryer cannot operate efficiently against the resistance created by the necessary duct work. The results are longer drying times, higher energy usage and costs, and excessive wear and tear on the dryer. 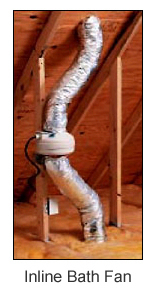 Dryer booster fans solve the problems caused by long duct runs on clothes dryers. How do they work? When the dryer turns on, the fan is activated by the automatic presure sensitive switch so warm, moist air is exhausted out of the house quickly. IAQSOURCE.COM offers a complete selection of interior fan grilles, backdraft dampers and exterior fan vents to provide optimum flexibility. Because our high quality fans operate at such low noise levels � timers and automatic switches are recommended. Automatic fan switching controlled by timers and occupancy sensors insure energy savings AND proper ventilation. 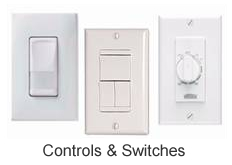 IAQSOURCE.COM supplies a wide variety of switches to control fan ventilation and other functions like light and heat.